This brief guide explains how to control the brightness of the your display using “Brightness Controller” in Ubuntu and its derivatives, such as Linux Mint, Elementary OS. There is also a CLI utility called “xrandr” that makes this job much easier from command line. For those who prefer GUI-based applications, “Brightness Controller” would be best. It can be used to control the brightness of your display, save a color profile, and load a profile from the saved list. It is completely free, open source and is written using “Python” programming language. Please be mindful that it is compatible with python2 only. The usage is absolutely easy. Once installed, launch “Brightness Controller” from Menu. This is how the default interface looks like. Just move the vertical sliders up or down to adjust the brightness. If you have four displays, then you can install simpler version of Brightness Controller to have four four display brightness sliders, one for each. Here is how simpler version of Brightness Controller looks like. And, that’s all for now folks. 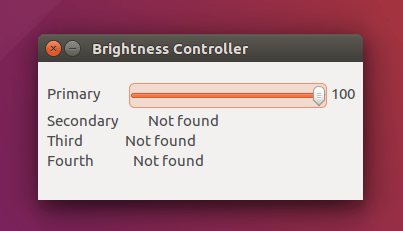 Make your display more friendly to your eyes using “Brightness Controller” in your Ubuntu desktop. If you find our guides useful, share them on your social and professional networks, so that other users also can benefit from them. More good stuffs to come. Stay tuned.